Kinesiology Taping. IASTM. Myofascial Cupping. These three innovative rehab therapies are piquing the interest of therapists around the world, and while some might consider them fads, evidence to support the effectiveness of these alternative techniques and the unmatched client results, are creating an overwhelming need for trainings. With this new RockTape certification series, you don't have to choose. Not only will you get the basic kinesiology taping training that everyone is talking about, but you'll also get two unrivaled sessions that walk you through Instrument-Assisted Soft Tissue Mobilization & Movement (IASTM) and Myofascial Cupping therapy, so you can give your clients the best integrative treatments to improve their function, mobility and healing time. 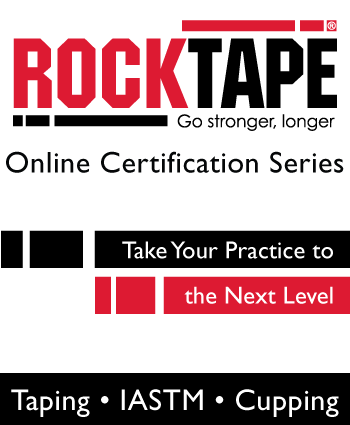 Plus, you will become a RockTape certified practitioner in all three methods from the comfort of your own home. RockTape has brought movement and pain solutions to over 50,000 professionals worldwide — and when all your clients are looking for is relief, it’s nice to know you’re trained by the best! Today Only $349.99 — An Unbelievable Value! Plus, earn 19.5 CE Hours — included in the course tuition! This 3-Part Series was designed to take your rehab to the next level by equipping you with the best RockTape foundation for your practice! Kinesiology taping is a revolutionary technique that has been sweeping the globe, with its unique ability to improve movement and function in a variety of therapies - and if you aren’t trained in it, you’re missing one of the most pivotal rehab interventions out there today. This must-have technique was designed specifically to accelerate recovery for an array of conditions like carpal tunnel syndrome, nerve entrapments, shoulder impingements, plantar fasciitis and so much more. It can be used with any rehab client - from pediatrics to geriatrics, athletes to at-home moms, and everyone in between. The skin-brain connection and how kinesiology taping affects physiological and neurological parts of the human body. The basics of kinesiology taping - including different tape types, features and characteristics, why RockTape is the best tape on the market and the different tapes for your clients. The fundamental taping techniques and treatment strategies, while caring for other conditions during rehab like cuts, care tips, tension and much more. How to combine taping with movement and what clients are the best to use this methodology with. Taping methods, applications, effects and benefits for pain, fluid dynamics, posture, dysfunctions, scarring, neuro tract irritation and much more. Coding and documentation for optimal reimbursement so you can give your client the best treatment. Have you been wondering how instrument-assisted soft tissue mobilization (IASTM) techniques could be used in your practice? You might've heard the term "IASTM" and associated it with rough techniques, overwhelming training or expensive tools - and in the past, that may have been true, but this IASTM Practitioner Certification session changes all that. This session taught by Mike Stella, ATC, CES, PES, GT, FMT shows you how to use these powerful tools also assist in reducing adhesions and increase healing rates of targeted tissue by giving you a more pinpointed method of treatment. 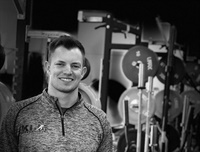 This unique breakout session is unlike any other training in the rehab space! Did you see Michael Phelps in the 2016 Summer Olympics in Rio? If so, you might have wondered what those circular bruises were. Yep, those marks were a result of cupping therapy, an ancient practice now used in rehab therapy around the world to improve circulation, stretch tight fascia for better mobility, increase lymph flow and oxygenate tissue and so much more. But this technique is rarely taught - which is why this innovative session gives you a one-of-a-kind training, so you can use cupping in your treatments for pain, sprains, strains, swelling, tendinopathies and much more. Cupping applications for all parts of the body - upper, lower, core, trunk, hips, diaphragm, neck, lumbopelvic region and much more. Learn more about RockTape certifications. 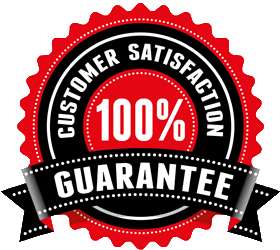 Get a Special Discount on Your Very Own RockTape Starter Kit! Retailed at $498.97 — Yours for ONLY $249.99 When You Register Today!! When you register today, you'll receive an exclusive email offer within 2 days to save 50% on your own RockTape Clinical Tool & Tape Kit! Treat your patients with superior tools at a fraction of the cost with resources from RockTape. 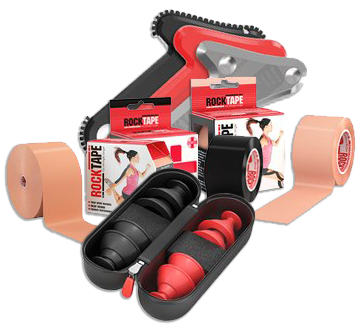 This starter kit brings together RockTapes' most effective IASTM tools – Mohawk and RockPods Cupping tools – as well as RockTape Kinesiology tapes. RockBlade Mohawk - Incorporate radically different IASTM treatments into your practice with the 3-in-1 RockBlade Mohawk tool. You will be impressed by wide range of treatment options that this one precision-crafted stainless-steel tool & it’s unique attachments provide. RockPods Cupping Tool - Forget complicated pumps and hoses – RockPods are designed to easily unlock entirely new ways to unstick and manipulate facia to reduce pain, improve range of motion and increase athletic performance. Watch your email for an exclusive offer within 2 days of purchase, to save 50% on your own RockTape Clinical Tool & Tape Kit!